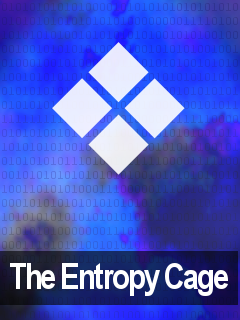 The Entropy Cage is a short choice-based science fiction story about warring AIs. I played to a couple of endings, though not to all the available ones. The core premise here is that you’re responsible for the psychiatric well-being of various AIs that do jobs like running traffic lights and controlling trains. Your job consists of querying them about their actions and then deciding which should be deactivated, so that when they go a bit weird and start ganging up on one another, it’s up to you to figure out which of the available actions you can take to sort things out. Most of your actual acts consist of choosing commands like “sub.punish()”, giving it a faintly Bad Machine flavor. As far as I can tell the vast majority of paths lead to bad endings. I think the intention is that you should replay the game a number of times in order to reach a single positive ending, but I wasn’t inclined to do that after my second loss. Replaying even once had felt fairly repetitive, because there’s not a lot of obvious change on the surface to respond to your choices in the early game, even if they’re moving behind-the-scenes stats that will matter later. In addition, the results of my actions were so unclear that it was hard to form theories about what I could do differently on replaying in order to improve things. I did go to have a look at the walkthrough, but this in fact discouraged rather than encouraged me in playing again, since it mentioned that some actions had non-obvious slanting effects on the rest of the game; and that there are randomized results that sometimes may cause different outcomes, even though the fact that it’s random is never made clear at all. So as a piece of puzzle design, this did not really work for me. The system was too opaque to manipulate with confidence. I didn’t know what actions might make a difference, and the element of randomness meant that I couldn’t even know whether I was getting a clear signal back in my experimentation. There’s a reason that a lot of choice + stats games (Choice of Games, Fallen London) put the stats right where you can see them: it gives the player some general notion of what the levers are doing. And I have the impression, though I suppose I can’t really know for sure, that the puzzle-solved ending might be significantly more narratively satisfying than the endings I did get. So, hm. Solidly built as far as I can tell; fine presentation; reasonably interesting premise; design choices that made it not work for me. One specific comment follows the spoiler space. As for the “glass of water or think?” question: In my experience if you’re going to do things where you’re trying to build a model of protagonist personality from subtle variations in player choice, it helps to be pretty up front that that is what you are doing, because players who do not know they are supposed to be role-playing will not factor “would my character do this?” into their choice calculations, and without that, there’s quite a lot of noise and raw experimentation in what they do choose. I experimented with silent personality modeling in Metamorphoses, long ago; as far as I can tell no one noticed until I told them it was there. By contrast, Choice of Games does it constantly and overtly, and that is one of the things that CoG fans enjoy. Also reviewed by Liz England, Sam Kabo Ashwell. Keep these reviews coming. I want to get into the IF comp one day and IF in general. I won my first time through. I didn’t find it narratively satisfying. I have no idea what I did that led me to it.